﻿With Paddy Power for iPhone and Android you can watch any UK or Irish race live for just £1 or watch the entire archive of every At The Races and Racing UK race for free. Get a clean racing news freed with no repeated news stories for videos. Personalise your news feed for favourite events, e.g. Ascot or Kentucky Derby. Watch videos personally curated from top YouTube horse racing channels. Leave comments and start discussions on any horse racing news story. 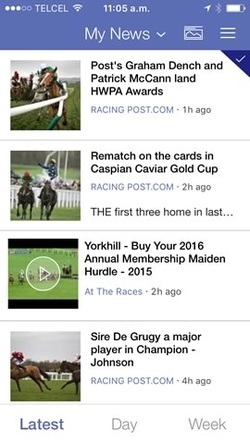 Horse Racing News & Videos is available on both iOS and Android devices. The horse racing world is starting to finally get its teeth stuck into the mobile industry and one of the more popular topics for these apps have come in the form of racing news. Many apps do include a host of topics from around the world of racing, but few are as in-depth and customisable as the Horse Racing News and Videos. The official title actually includes ‘Kentucky Derby, Breeders Cup, Melbourne Cup and more’, but don’t let that make you think it’s diluted to just those events. 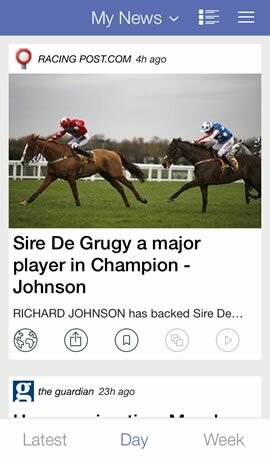 The app covers racing on a truly global scale and one of the best features is that you can customise exactly what sort of racing stories you want to see on your feed, of which we discuss more in the nest section. ﻿The app opens up straight into the news feed and here you can scroll down to see all the latest news pulled from a variety of sources around the web. One of the things that we were most impressed about is that they don’t have any news topics cross over. For example, where several of their sources may be writing about the same topic, the app will only include one of these to keep things feeling clean and streamline. This may not sound like that big a deal, but trust us when we tell you that very few apps actually do this. At the top of the app you are able to click the ‘All News’ button that then takes you to where you can customise your feed even further. The topics include things like the Kentucky derby, World Series, Breeders’ Cup, UK horse racing, Australian Horse Racings, tips and previews. You can then highlight the topic you are most interested in and your news feed will adjust accordingly. You can also disregard some topics so that the news feed will not show these topics at all if you wish. What you will find from most of the stories is that the app shows you a brief paragraph of that news story, before then allowing you to click the ‘continue’ button to continue to read further. From there it will take you to the sources page but it does load within the app, so it wont require you to load your mobile browser at all or even leave the app, which is good. Each story allows you to interact by leaving comments on the topic you wish. It links up to your Facebook account so you can see what your friends are commenting on that particular topic or just what the community are talking about in general. The standout feature for the app has to be the ability to customise the feed that is shown throughout the app. The ability to choose exactly what you want to read about is something that’s fairly unique to apps of this sort. The downside comes in the limited number of topics to filter your results for. For example, US users may be looking for US racing news, but the only options really come in the form of the Kentucky Derby and Breeders’ Cup. Whilst these are obviously popular events, it does leave a pretty big gap for the remaining events on the US calendar.